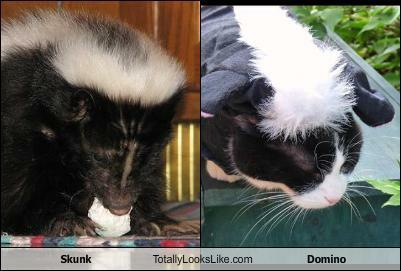 Thank you to all who commented yesterday and ranked Domino's outfits and poses. We'll get to the results shortly. First of all, though, here is my all-time favourite photo of Domino dressed up as Minnie Mouse from two years ago. 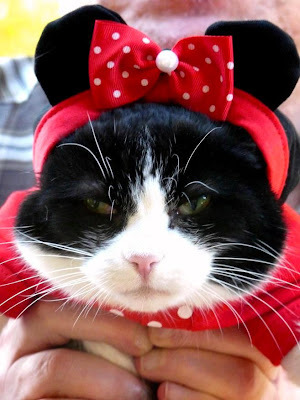 I like to call her Dommy Mouse. And then there's the time I dressed her up as a skunk! Those were the good old days. With this feedback from Domino's fashion fans, we can look for more outfits that will please your aesthetic sensibilities, and Domino can practice her most popular poses for future posts. I still like the dress Domino wore to my birthday pawty the best! And She looks wonderful in them all! Domino is dreamy! It was quite a tough choice because she looked great in so many things. I do think red is her color! Oh my favorite was the birthday party outfit because it's the fanciest, and the pinkest! I'm glad to see that Domino takes to heart the opinions of her fans! We like the mouse outfit, too! Dommy Mouse is pretty darn cute! WENDY'S 3-DS: SWEET 'N SILLY! 3-D WORDLESS WEDNESDAY: SNACK TIME! HAPPY BIRTHDAY, DOMINO -- AND ALFIE, TOO!